Cirque Éloize has been touring its shows in proscenium theatres around the world for the past 25 years. TO Live (the recently re-branded Civic Theatres of Toronto) is presenting their newest show at the St. Lawrence Centre. Hotel follows hot on the heels of shows by other theatrical circus companies from Quebec–Cirque du Soleil and Les 7 doigts de la main–which also played runs in Toronto within the past two months. Unfortunately, I don’t think Cirque Éloize’s offering measures up. Hotel has no shortage of talent, the show features a cast of 12 young, fresh-faced, multi-talented cast members, every one of whom is a graduate of Canada’s National Circus School in Montreal (except for the singer). There are some individual acts which are highlights. 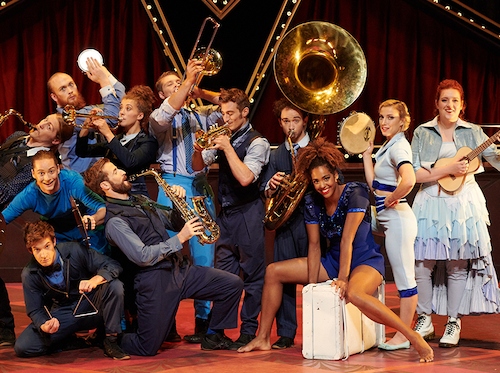 Some of my favourites include the dance/juggling number by the remarkably agile Philippe Dupuis, a gorgeous contortion and aerial straps number by the statuesque yet lithe aerialist Tuedon Ariri, as well as the cleverly staged ensemble number where various cast members manipulate hula hoops in different ways. These are the few individual scenes where I thought the music, acrobatics and movement design really came together to create a cohesive act. But as a whole, I thought the show was a jumble of half-formed ideas. Director Emmanuel Guillaume starts with a setting, the Art Deco-style lobby of a grand hotel, but pretty much ends there too. What’s missing is the attention to detail in the artistic content of the show; the writing, the character work, the choreography, the bigger picture ideas that frame the individual circus acts and provide a context for them. It may sound a bit precious to harp about the weak artistic content of a circus show but much like dance is more than just a collection of random motions synchronized to music, theatrical circus shows ought to be more than just an aesthetic framing device for a collection of physical feats. The best theatrical circus shows combine circus with theatre, music, and choreography to express a larger idea or evoke an emotion. Those are the elements that I felt were missing in Hotel; the show lacks depth, doesn’t evoke emotion and never amounts to more than just the sum of its parts. This lack of attention to detail is most evident in the interstitial scenes between the circus acts. They’re comedic in nature but they lack structure and felt painfully awkward to watch as performers just crossed back and forth yelling random lines with a goofy delivery, desperately grasping for laughs. It reminded me of bad high-school improv sketches. The staging of some of the acts themselves sometimes also falls short; like the hand-to-hand balancing act later in the show performed by Emma Rogers and Andrei Anissimov. It’s the second hand-to-hand act in the show so it feels redundant. The lights flicker and audio from old movies play: is it a tribute to the Golden Age of Hollywood? The music sounds vaguely like a love ballad: is it a love story? But then why are all the other cast members moving about on stage during the act, randomly pairing off and forming towers? This scene, more than any other, illustrates the show’s lack of editorial focus and clarity around its ideas. The musical score by Éloi Painchaud, a mix of brassy jazz with some more contemporary rhythms, is the one creative element that attempts to string the show together. The featured vocalist, Sabrina Halde, is a jazz singer with a shimmering, coppery timbre to her voice and was definitely a highlight of the show for me. However, because of the lack of structure in the overall concept of the show the individual musical numbers also feel similarly disjointed. Overall, I just think the show is crying out for a writer and/or dramaturg or somebody who can find some clarity in the jumble of underdeveloped characters and half-formed ideas. If you’re able to overlook the shortcomings in the presentation you may be able to enjoy the show more than I did but Hotel just seemed like the same old bag of circus tricks I’ve seen dozens of times before and I found it tedious. Tickets are available online at ticketmaster.ca, by calling 1-855-985-ARTS (2787), or in person at the following TO Live box offices: Toronto Centre for the Arts Box Office, 5040 Yonge St.; St. Lawrence Centre for the Arts Box Office 27 Front St. E.